I’m excited to be announcing the winners of the 2nd challenge of season 2: What’s in a Name. 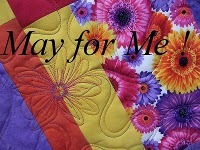 Eighteen amazing quilts were submitted – I’m sure it was hard for both the judges and the public once again! Christine Hampton!taking home 23.45% of the votes (or 53 of the 226). Congratulations Christine – I hope you enjoy all your goodies! Judge 1: I just love everything about this bag. I want it! Your story is fantastic and I also love couture magazines. Great job. Judge 2: Great application of the challenge, playing on the words. The way each element represents a designer is an excellent representation of the theme. 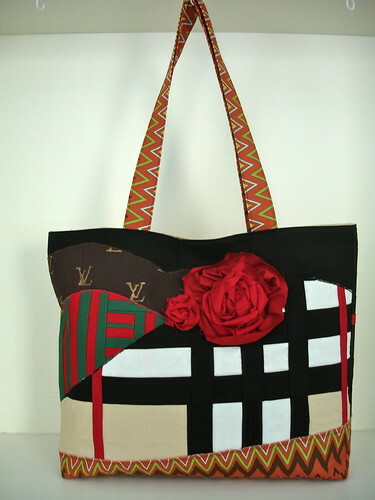 Great stenciling - I thought it was an LV fabric remnant. The balance of the curves is well done. I like that you used the two vertical red strips to tie the elements together. Mixing a few different sized flowers instead of one big one gives it more decadence. 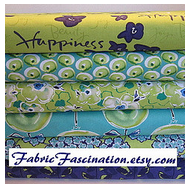 The open zig-zag in the bottom fabric was a great choice. Judge 3: Love the story and how you interpreted the Terre Haute name. It captures the spirit of this challenge. Even the fact that it’s a bag fits with your haute couture interpretation. Wonderfully done. Judge 4: Wow, talk about unexpected! I love the leap that you took from the location name to your very unique interpretation of “haute”. The ways in which you incorporated bits of different designer influence is really quite ingenious. I especially love the small bit of patchwork to represent Gucci. Most importantly, I appreciate that you embraced the challenge and really stretched the limits of your comfort zone. 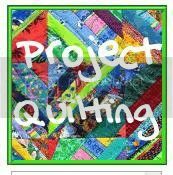 Your statement that “all of the techniques I used for quilting this project were new to me” is what Project Quilting is all about. Great job! Now get out there and carry that sure-to-be-a-conversation-starter proudly. Judge 1: The quilting on this quilt is fantastic. I love the background, the river; your eagle is almost real. Great overall piece! 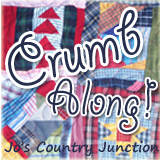 Judge 2: This is a great concept for your place name. 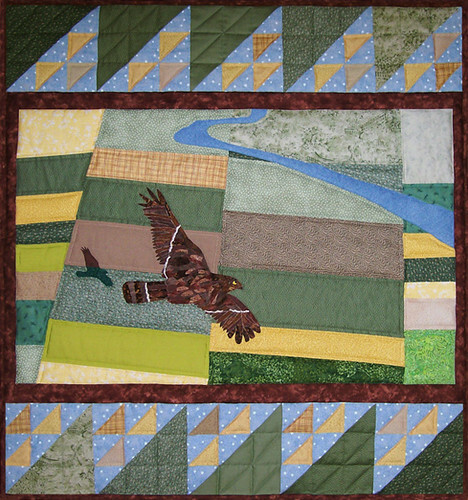 You really captured the sense of the rural heartland, and with the ambitious style of the bird and aerial perspective. The way you did the bird with all the fused fabric pieces is wonderful! They seem like brushstrokes. The stitching on the bird adds great definition to the shape of the body and feathers. The shadow is brilliant, especially how the darks look so much like the fields below it. It adds a sense of motion, which combined with the river element gives the piece nice movement within the flat block landscape.. Keeping the quilting as simple echo patterns works very well with the geometric landscape. That was an excellent choice. Judge 3: What a wonderful piece! I really love the combination of traditional blocks with the art quilt. Sometimes I feel like the traditional gets lost in all of this. The farm fields are gently rolling. The shadow is perfectly done. The bird is a work of art in itself. Dark brown frame is perfect. It hangs flat and straight. Great job. 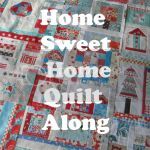 Judge 4: Wow, I am SO impressed by your quilt! 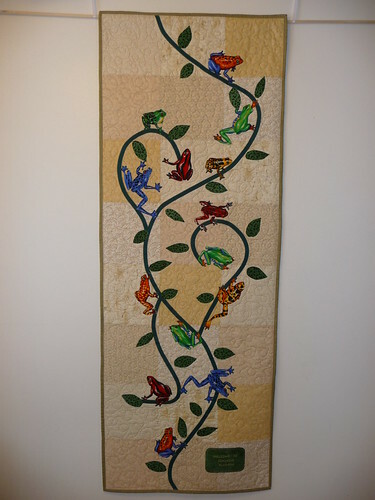 Your combination of traditional quilt elements with the modern techniques of art quilts helped you to create a truly stunning piece. I first noticed the traditional patchwork elements on the top and bottom border, and was fascinated to read that you angled them on purpose to add perspective. That was a particularly effective choice. I also love the patchwork look of the fields. It is clear that a lot of work went into creating the bird, and the feathering effect is very, very cool. Judge 1: This is a very clever use of the name of your town. Great play on the word, love it. I love the button border and am glad you opted for the extra color. Your 3D leaves are great. Judge 2: I really like how you chose to go tall and narrow, and focus on a macro view instead of the entire tree. The tan fabric gives a great sense of place. Keeping the leaves rough-edged gives a natural feel and they are cohesive with the fringed edges of the linen, which is a great texture. I love the layering of the leaves and how they go 3-d at the bottom. The randomness of the button colors, sizes, and placement gives nice pop to the piece. Judge 3: Great project. 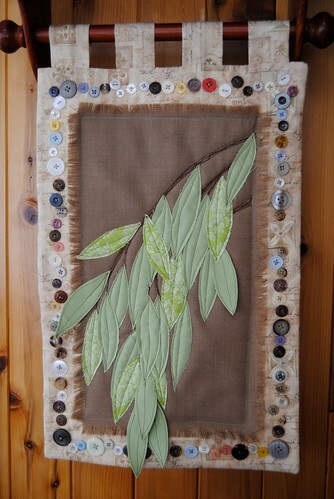 The dimension of the willow leaves is wonderful and I love the way they float over the edges of your quilt. The brown linen with the fringed edge gives another dimension. The buttons make a great frame. I’m glad you mixed the colors. Judge 4: What a beautiful little wall hanging. “Buttonwillow” certainly lends itself to a literal approach to the challenge, and I love the fact that it bridges nature and craftiness! Your technique for creating the willow branches and leaves was spot-on – you achieved a very realistic and yet stylized design. The buttons around the outside add a lot of character to this piece, and I believe your decision to introduce a wider variety of color was the right one. My favorite part of this piece was your choice of the brown linen and the decision to fray the edges. It's not an “in your face” detail but, once noticed, it adds that special little touch. Great work! And I will end this with a ‘Bravo’ and ‘Congratulations’ to all our winners and a quick reminder that the next challenge will be posted tomorrow! Oh thank you!! I had such a good time with this challenge, I'm glad to know that others enjoyed my piece too! 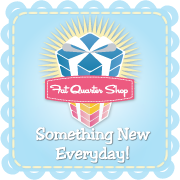 Congrats, Quilties...I thought that was a lovely piece. Congratulations to all the winners! What a wonderful group of quilts. Congrats to all of the contestants. Everyone is coming up with such creative ideas and great work! Congrats to all the winners! Such great pieces! Congrats to everyone who participated, especially to the winners! 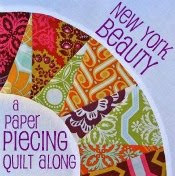 I'm so inspired by this competition and my fellow quilters...can't wait to see what happens this next week! !